On top of all the tax breaks and other incentives granted to Rusal, for years now, they were also offered a free rein on fuel imported into Guyana. The country gave up millions of dollars of what would otherwise be revenues. According to documents pertaining to the contracts signed by Rusal’s subsidiary, Bauxite Company of Guyana Inc. (BCGI), the company has been benefitting from a fuel import licence with concessions that allows them to pay no taxes on it. Rather, the Guyana Energy Agency would mark the fuel and send it along. The licence to import fuel is important, as it is now emerging that the Russian-controlled company has been operating for nearly a decade and a half in Guyana, without declaring a profit. The profit would be crucial as Guyana owns 10 percent of BCGI. Guyana got naught in dividends. Consecutive governments appeared not to care much about Rusal’s operations and what it was doing. In fact, nothing was done when in 2009, Rusal sent home 57 workers, including supervisors, for protesting better pay and working conditions. Critics have been pointing out that Guyana bent over backwards, giving up millions of dollars of revenues so that Rusal would have a better edge of profits at its operations in the Kurubuka mines, Upper Berbice River, Region 10. 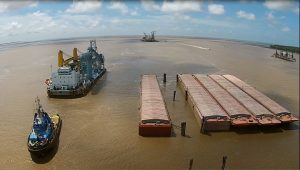 There has not been any bauxite shipped for weeks now from Rusal’s operations in the Berbice River. A decade and a half ago, the Government of Guyana entered an agreement with subsidiaries of UC Rusal for the management of the Aroaima Mining Company and for the development of the Kurubuka area. The company not only inherited assets, including equipment and housing units with infrastructure, but also operations, which were considered going concerns. The Government, in the mid-2000s, invited Rusal to invest in the Aroaima Mining Company, which was being operated by the state and which was experiencing declining production and sales. According to the Fiscal Incentives Agreement, which was signed March 2005 between Guyana, the Bauxite and Alumina Mining Venture Limited, located in Cyprus; Bauxite Company of Guyana Inc. (BCGI) and Guyana Trading Company Limited (GTC), registered in the British Virgin Islands, Rusal/BCGI enjoyed years of tax breaks. Among other things, BCGI was exempted from the payment of income, corporation, and property taxes for the period of five years commencing from the effective date of the management agreement. It was agreed also that the company would be exempted from the payment of Withholding Taxes on interest, dividends and lease payments to its affiliate for the whole period of existence of the arrangement. The company was given a free rein to import all items that it says are related to its operation. The deal includes exemption from payment of all and any duties, including Customs Duties, and taxes, including purchase taxes, on equipment, machinery, motor vehicles and supplies. With regards to the last, the Government agreed that the company would benefit from these concessions for as long Rusal/BCGI remains here. It was agreed, too, that the company would not pay any royalty for any bauxite produced during the first five years. After that, the government, under then President Bharrat Jagdeo, agreed that royalty shall be payable at the rate of 1.5 percent on the Freight On Board (FOB) value of shipments from New Amsterdam. The government also agreed that it cannot just make amendments to, and changes of applicable laws that can directly affect the financial position and or operations of the company, without its prior approval. Under the mid-2000s arrangement, Rusal/BCGI was supposed to manage the Aroaima mining area and facilities and to explore and develop the Kurubuka deposit. Rusal appears to have been doing anything it wanted in and to Guyana. Following its refusal in 2009 to reinstate the 57 workers, it ended up in a similar situation this year. In mid-February, workers downed tools and asked management to explain a one percent increase. However, they were ordered to return to work. The workers refused and have been holed up in Aroaima, a Region 10 area where Rusal houses employees. For five weeks now, there has been a standoff, with no bauxite being shipped. The company is working with a skeleton crew, stockpiling the ore.
Workers in the meantime have blocked the Berbice River, refusing to allow any vessels to pass. Rusal after initially refusing to meet with union, faced significant pressure, finally agreeing to conciliation talks to end the impasse. One such meeting took place Friday with another set for today. In the meantime, the workers have been helped by communities surrounding the mining area. None of the 91 workers whose services were terminated knows if and when the next paycheck will be coming.